1.What is meant by a substance? A pure substance is the one that consist of a single type of particle i.e. all constituent particles of the substance have the same chemical nature. 2. List the points of differences between homogeneous and heterogeneous mixtures. 1)Those mixtures in which the substances are completely mixed together and are indistinguishable from one another. Those mixtures in which the substances remain separate and one substance is spread throughout the other. 2)They have uniform composition throughout its mass. They do not have uniform composition. 3)It has no visible boundaries of separation between various constituents. It has visible boundaries. 1. Differentiate between homogeneous and heterogeneous mixtures with examples. 4)For Ex: Sugar solution,Salt solution,Alcohol and water,Soft drinks etc. For Ex: Sugar and sand, Salt and Sand,Milk,Soil,Blood,Starch,Muddy water etc. 2. How are sol, solution and suspension different from each other? Sol is a heterogenous mixture in which the solute particles are so small that they cannot be seen with naked eyes.They seem to be spread uniformly throughout the mixture.They show tyndall effect. Solution is a homogenous mixture in which solute particles dissolve and spread uniformly throughout the mixture.Solutions do not show Tyndall effect. A suspension is heterogenous mixture in which small particles of a solid are spread throughout a liquid without dissolving in it. For ex: Chalk and water, muddy water, sand and water, flour and water. 3. To make a saturated solution, 36 g of sodium chloride is dissolved in 100 g of water at 293 K.
Find its concentration at this temperature. is more than 25ºC), which are miscible with each other? A mixture of two liquids having a difference in boiling point more than 25ºC can be separated by the method of distillation. 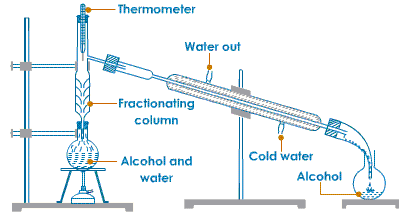 In this method, the mixture of kerosene and petrol is taken in a distillation flask with a thermometer fitted in it.We need a beaker, a water condenser and a bunsen burner.Then the apparatus is set as shown in the diagram.The mixture is then slowly heated.Kerosene will vaporise and condense in the water condenser.the condensed kerosene is collected from the condenser outlet, whereas petrol is left behind in the distillation flask. 3. What type of mixtures are separated by the technique of crystallisation? It is used for obtaining a pure solid substance from impure sample. For Ex:Impure copper sulphate can be purified by the method of crystallisation. • burning of paper and wood. 2. Try segregating the things around you as pure substances or mixtures. 2. Write the steps you would use for making tea. Use the words solution, solvent, solute, dissolve, soluble, insoluble, filtrate and residue. 1)Water , the solvent is taken in a kettle.This water is allowed to boil. 2) During heating, sugar and tea leaves are added as solute. 3) Milk , tea leaves and sugar together form solution. Sugar dissolves in milk. 4) Then the solution is poured on a strainer. 5) The remaining tea leaves being insoluble remains as residue. 6) Colour of the tea leaves goes into solution as filtrate. 3. Pragya tested the solubility of three different substances at different temperatures and collected the data as given below (results are given in the following table, as grams of substance dissolved in 100 grams of water to form a saturated solution). Mass of potassium nitrate needed to produce its saturated solution in 100g of water is 62 g.
Mass of potassium nitrate needed to produce its saturated solution in 50g of water is 31 g.
(b) Pragya makes a saturated solution of potassium chloride in water at 353 K and leaves the solution to cool at room temperature. What would she observe as the solution cools?Explain. The amount of potassium chloride that should be dissolved in water to make a saturated solution increases with temperature.As the solution cools down some amount of dissolved potassium chloride will reappear as undissolved solid. Ammonium chloride has the highest solubility. The solubility of salt increases with temperature. 4. Explain the following giving examples. A solution in which no more quantity of solute can be dissolved at given temperature is called saturated solution. Suppose 100 g of a solute is the maximum amount that can be dissolved in 200 g of water at 298 K.Then 300 g of solution so obtained is the saturated solution at 298 K.
For ex: Sulphur element is made up of only one kind of sulphur atom. Water is made up of only one kind of water molecule. A solution in which the size of solute particles is intermediate between those in true solution and suspension. For ex: milk, blood, starch solution, soap solution. A suspension is a heterogenous mixture in which small particles of a solid are spread throughout a liquid without dissolving in it. For ex: muddy water, chalk water, sand water etc. 5. Classify each of the following as a homogeneous or heterogeneous mixture. 6. How would you confirm that a colourless liquid given to you is pure water? Every liquid has a characteristic boiling point at 1 atmospheric pressure.Pure water has a boiling point of 373 K at 1 atmospheric pressure.If the colourless liquid boils exactly at 373 K at 1 atmospheric pressure then it is a pure water.If there is difference in boiling point then water is contaminated. Answer: a, c, d, e and f are pure substances. 8. Identify the solutions among the following mixtures. 9. Which of the following will show “Tyndall effect”? 10. Classify the following into elements, compounds and mixtures. 11. Which of the following are chemical changes? (g) Burning of a candle.